There is a common myth that kids want their parents to stay together or get back together. In reality, what kids want, more than anything else, is peace. If peace is enhanced by the parties separating or divorcing, then let it happen. The author of this article either talked to a lot of kids whose parents divorced – or perhaps is the child of divorced parents herself. She understands that children rarely want to pick sides. They don’t care how much child support is being paid. It is for this reason that I have frequently criticized Wisconsin courts for not allowing contingent custody orders or allow enforceable non-modifiable child support orders. Once a child’s basic needs for food and shelter are satisfied, children need peace, not the highest standard of living possible. 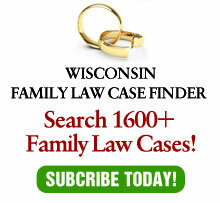 This article should be mandatory reading for very Guardian ad Litem – and court in Wisconsin.